Hello Lovelies! Lately it has been raining ridiculously here. No I don't mean like cats and dogs I seriously mean R-I-D-I-C-U-L-O-U-S-L-Y...Sorry for the exaggeration, but I had to elaborate. Just the other day on the news, the first floor of the mall a town over from mine was closed down because it was flooded and there was sewage seeping throughout. Now I don't know what the stores did about the merchandise or if they were damaged, but if Forever21 is having a killer sale this weekend, I wouldn't be surprised if it was with damaged merchandise. Not like I would complain if I can throw it into the washing machine. Throughout the nasty weather I was able to weave in and out the rain (and online) to make some darn near perfect purchases. 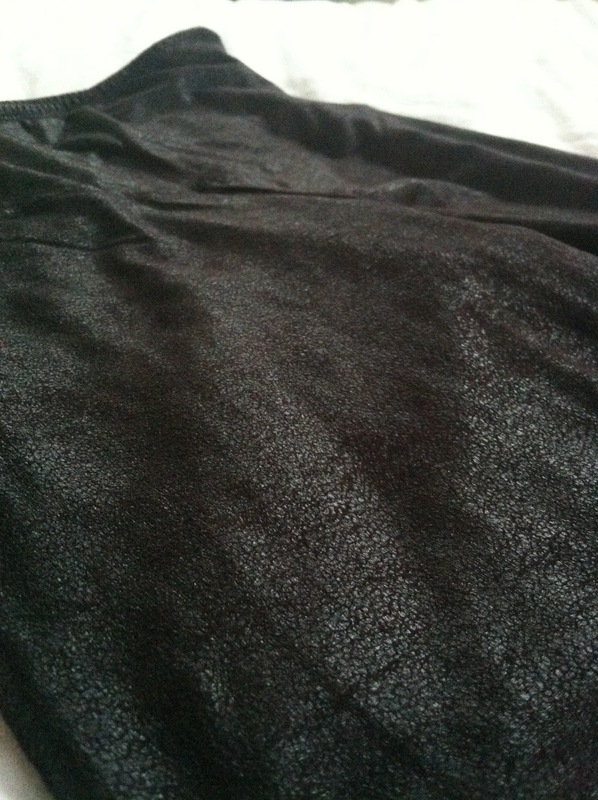 The trend in mind: Leather, faux leather that is. I have to admit I was a bit intimidated to try this trend with the whole only rock n' rollers or bikers wear it stereotype. Once I kicked my assumption bad habit, I gave it a try and I haven't turned back. I am taking this trend and running....to the store.....and then back to my closet. 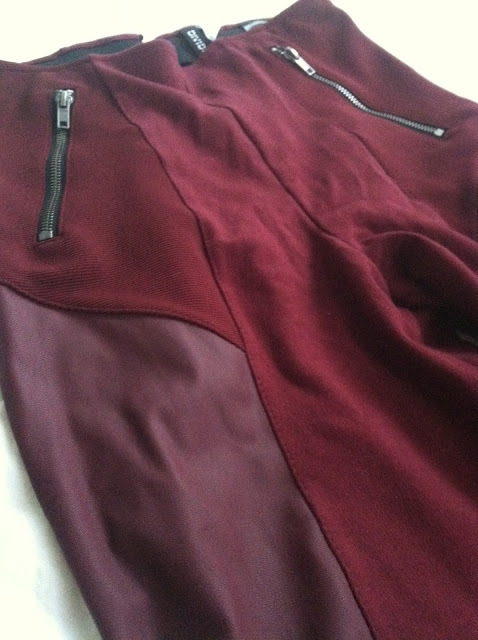 My first rocker chic find was these oxblood faux leather panel pants from H&M. These pants are AMAZING! 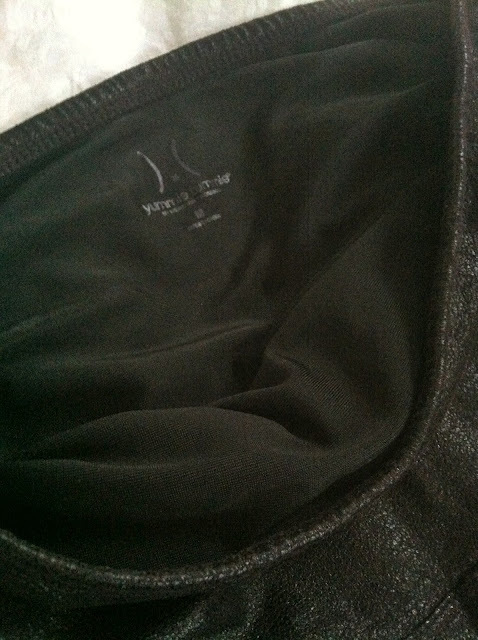 They are sooo comfortable and have the right amount of stretch for my juicy pear shaped hips. Yes I said it...JUICY!! Pants need to have enough give for this derriere and these pants do the job. Not only does the color and faux leather with exposed zippers in the front and a single in the back make this a great find, the price is just right outstanding! You can snag up these delicious pair in this color or black for a whopping $12.95. I ain't lying! You should go get some...now...no really, right now. The second great find was actually gifted to me by YummieTummie via the Lucky FABB conference I attended last month. In my swag bag was a generous gift card to purchase a "yummie" piece from their website. They are well known for their slimming leggings, tanks, denim, and undergarments. With so many options I just had to go with their Jada Leggings. I mean honestly, how could I resist a Faux Leather Legging that not only looks great, but slims my lowers? Though these leggings are a bit out my price range at $68.00 a pair, let me tell you that I freaking LOVE these pants. LOVE THEM! They are ultra comfortable and the finish on the leggings does not look cheap like I encountered with some faux leather leggings in the past. These pants have a great amount of stretch, but have a sturdy enough hold to tuck in that I ate too much ice cream and chocolate donuts belly I get from time to time. I am seriously considering ordering the cognac pair I love them that much. Of course I will have to save up for them, but I am glad that I got a chance to try them out first. Thanks YummieTummie!! Eventually I would love to add more leather touches to my wardrobe to include this, this, and this, but for now these will do. You know, this whole leather trend has really got me thinking that maybe, just maybe I actually do have some rocker tendencies in me. I mean I like to flip my hair back and forth, listen to alternative music, and wear black nail polish.... NAH....I think I just like how it looks on. Believe me that these pics don't do them justice. They are better in person and on! :) Thanks for reading! Love all of these pants! Sure thing Jayne!. Thanks for reading!